Stormwater management should be an integral component of any site design, but making it look attractive can be tricky. 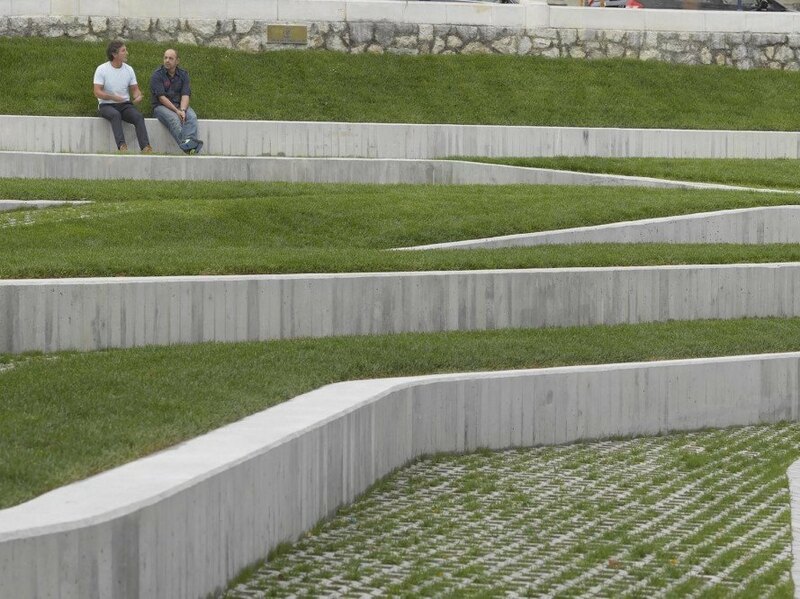 Madrid-based Zigzag Arquitectura rose to that challenge and turned permeable paving into a beautiful design component in the San Martín de la Mar Square, a public square and amphitheater in Cantabria, Spain. Built to overlook the sea, the urban park comprises a series of terraced geometric platforms with alternating bands of grass, permeable paving, and concrete. The 1,770-square-meter San Martín de la Mar Square not only mitigates a steep change in slope, but also helps reconnect urbanites with the waterfront. Softscape covers the majority of the square, which includes two routes to the water: a long staircase that offers the most direct path, and a series of ramps made with permeable pavers. A slightly sunken hexagonal-shaped platform made from synthetic wood paving is located near the bottom of the site and serves as a stage for performances. A second, smaller platform framed by trees located opposite the stage accommodates children’s play and features rubber flooring and swings. “The new San Martín de la Mar Square aims to rediscover and boost the privileged location this urban enclave holds in the city of Santander, referring especially to the views which can be obtained from it,” write the architects. 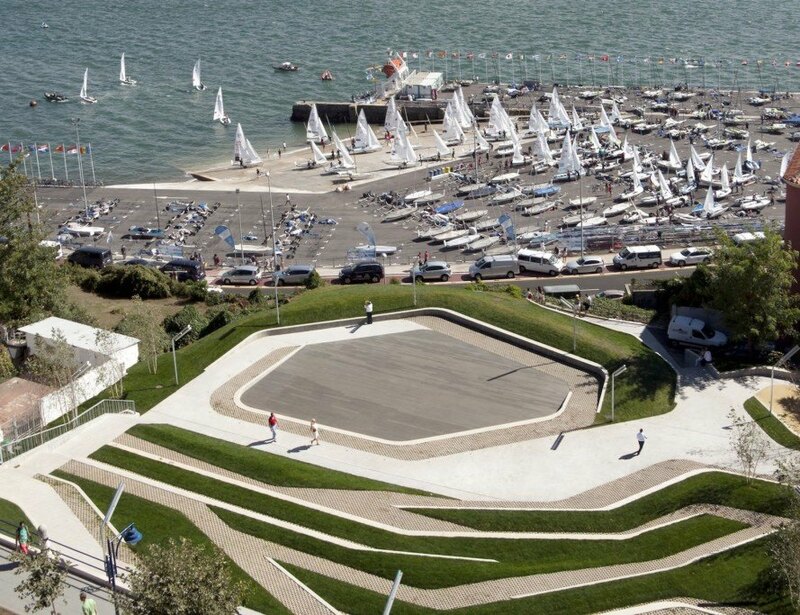 “Its new condition of urban viewpoint allows visitors to enjoy exceptional views oriented to the south, reincorporating the lost images of the bay and the passage of ships in that area of the city. Its new configuration as a promontory and the intentional position of the trees and vegetation, enable an optimal capture of views and visual escape.” The concrete structures double as seating and retaining walls, while the permeable pavers allows for the natural drainage of rainwater and are arranged in a pattern inspired by the fishing nets used at sea. The 1,770-square-meter San Martín de la Mar Square not only mitigates a steep change in slope, but also helps reconnect urbanites with the waterfront. Softscape covers the majority of the square, which includes two routes to the water: a long staircase that offers the most direct path, and a series of ramps made with permeable pavers. The permeable paving is used to create visual interest and added texture. The concrete structures double as seating and retaining walls, while the permeable pavers allows for the natural drainage of rainwater and are arranged in a pattern inspired by the fishing nets used at sea. A slightly sunken hexagonal-shaped platform made from synthetic wood paving is located near the bottom of the site and serves as a stage for performances. Plan view of the square.